Today life has become an impossible rat race.. everyone is running, trying to beat the others, often not even knowing what they are running after. It is a chaos of clueless souls. Even in the midst of that, sometimes.. though rarely, we contemplate, think about what we really want.. only to end the reverie without a proper response. We are confused.. after all.. there are so many options when you look around, but only so many when we think of what we can actually do. By some miracle even if we decide something, it is more often that not driven by the perks of it, blatantly ignoring the pain or struggle that comes along. What are you looking for in life? Is it power, happiness, money, spirituality, meaningfulness? I mean you.. not what others want from you or you think would be nice to do for the sake of someone else.. How to come out of this race and find out your purpose in life.. as in why were you born and why do you exist among the billions? I have these same question in my mind all the time.. and thus am glad that I picked up this book! It may be weird but the title of the book makes perfect sense when you plod through it till the end. The author uses her personal experiences and general settings as well to make her points clear. The personal touch is very helpful as I didn’t feel that these are just some tales when some seemingly impossible stories were put up..
What I really really liked about the book was the funny yet strong tone of the author. 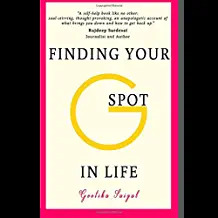 I honestly had not expected so much fun in a non-fiction self-help book.. two phrases which seem synonymous to boring and monotonous to people! The light yet no non-sense tone is what sets this book apart. That’s not all, the chapters are almost always followed up by Do-It Yourself exercises which take the words in the chapters a step ahead. Given the tone of the book, it may be a temptation to read it all at one go but it is best to go slow with this one.. digesting each chapter’s content as you go..
Like, Share and Subscribe for more such reviews and bookish content. Previous Post “The Invention of Hugo Cabret” – Book Review | The most stunning book I have ever read! + The hype is real! I quite enjoyed this book! It was fun and motivational too!